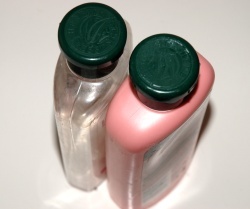 How can I reuse or recycle hotel shampoo bottles? | How can I recycle this? 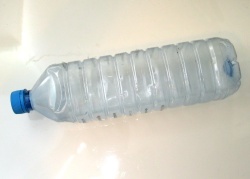 How can I reuse or recycle hotel shampoo bottles? Back in the day, before I realised what an ecological nightmare they were, I used to yoink the mini shampoo bottles, soaps and leftover shower caps from hotel bathrooms, particularly when we stayed in fancy hotels and they came in interesting bottles and smelled of great things. I built up quite a collection and I know I’m not alone in doing so (hi mum!). These days we take our own (full size or thereabouts) supplies with us when we go away but I’m also still working through the stack of these little bottles in the back of the bathroom cupboard. Aside from refilling the empties for gym/spa/pool sessions when you don’t want to lug a full bottle of shampoo or shower gel, does anyone have any other suggestions for reusing these little single-use-size critters? well, if they don’t have the hotel name on them, you can always refill them and make a spa gift basket for someone. use them for sand art for kids. wash them, put water inside and freeze them. Once they’re frozen use them to keep your lunch cold. if you mix paints, or any other liquid. Donate them (full) to a homeless shelter, shelter for abused women or similar. Small bottles filled with water and frozen make good icepacks for small injuries such as jamming a finger or soothing a bug bite. i used them for small beads. Last Christmas I spent some time checking shoeboxes folk had filled for sending to Eastern Europe and thought how useful those little bottles would be – will be saving any this year for that purpose ! I refill them for when we go swimming. As I only buy my shampoo in large bottles (save on packaging) I can’t take these bottles to the pool so re-using these tiny bottles a must and it’s cheaper if they get left behind. Most of them are #1 or #2 plastic, so they can be recycled. I also like the ice pack idea since I take my lunch to work. I use the lotion ones and continually refill it with my own lotion and keep it in my purse. Children can make sand art with them. If you got many of them, turn them into chess pieces, gluing pictures of horses, kings, etc on them. The chock lines on a concrete can serve as chess board. 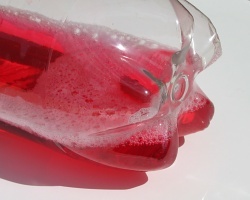 If you bought a big bottle of mouthwash and it won’t fit in your bathroom cabinet, you can clean out a bunch of the little bottles and fill them with mouthwash. trim some country style decopages and appley them onto the small plastic bottles and some bathroom soaps. put them in a large basket in your bathroom they will give a good decorative affect besides smelling good. clean them out, sterilize, etc. Then fill with choice condiments (salt, pepper, soy sauce, ketchup, mustard, mayo, horseradish, dressing, etc), apply label or stickers, and use for picnics, in car, in lunch, at work, desk or school, vacation, camping. Sometimes work environments have shared refrigerators in which people store food, lunch, etc., and these articles sometimes walk. you can also do the same by creating mini samples for insert into gift baskets or care kits. Chocolate powder, sprinkles, etc. for cocoa, ice cream. you can also create mini kits for coffees, teas, and other drinks by packaging each ingredient per bottle; re-label bottle. bag the goods in clear baggie, tie colorful ribbon around neck, cut off top of baggie; apply sticker or creative fancy label to the set. ditto that for a bath kit–bath salts, crystals, bubble bath, foam. these kits can be gifted at visits, to guests, for pick me up’s with a card to friends, family, others, and for children’s/girl’s sleepovers. you can also apply the same concept to sharing your own personal stash of aftershave, cologne or perfume. add a sample to a bottle, add to a kit. 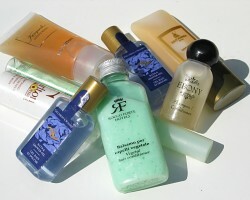 you can also take a generic lotion or bubble bath bought for cheap, and upscale the smell, look or texture by adding some ingredients, and then repackaging and sharing or selling. you can add a special plastic, colorful ‘gem’ bead to the bottom of lotion bottles to help with getting all lotion from the bottom; and the bead can be an aromatic gem in someone’s car, desk, etc. the small bottles can also be mini water bottles for runners, children and pets on the go. you can also add special beverages, including milk, sports drinks or adult ones. freeze the bottles for instant cool drinks when at outdoor concerts or events that are portable and less expensive than on-site drinks. the good ideas above that included freezing the bottles with water to use as ice packs–you can also drop these into a larger sports bottle when cycling, at the gym, etc, to keep drinks cool. You can donate them to a preschool or kindergarten teacher, she will know how to use them for sure. ie: classify by shape, color, size, full or empty…toys for water and sand tables… etc.